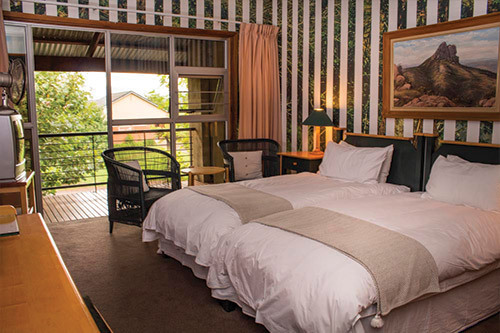 Forest Falls is between Sabie and Graskop, but it also materialises tantalisingly between the lines in this room. It is off the beaten track, so many who stay at this hotel will miss it on their way through. In a sense, I’ve brought the local environment into the room. I hope that if you stay in this room, you get the feeling that if you peel away the strips of white wall, you could step into this imaginery place. Or you could go downstairs and ask directions to the place itself. Your experience between these walls, surrounded inside by what is outside, becomes a virtual souvenir postcard.